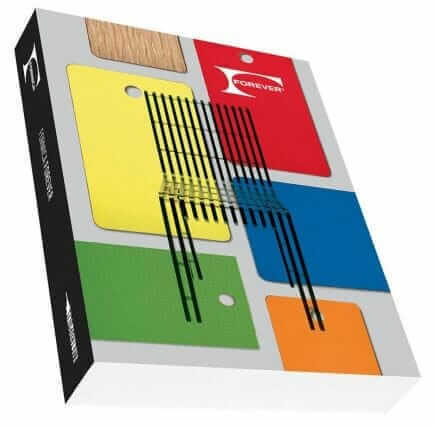 Oh so pretty: The Nevamar Venus laminate pattern — in four colors, including turquoise, lemon yellow, beige, and white. 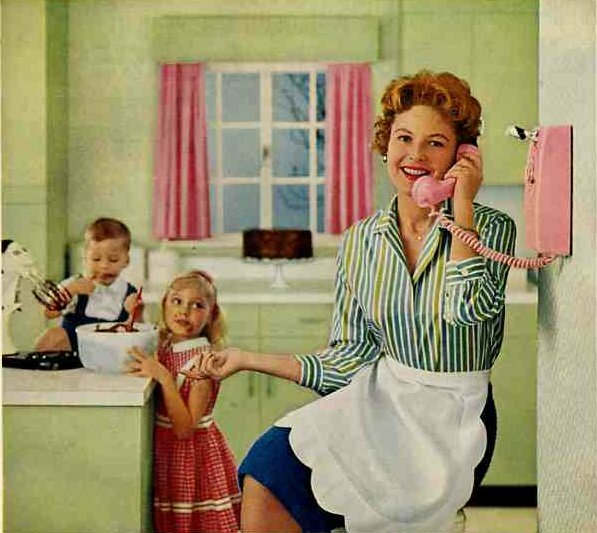 The atomic pattern in this vintage is delightful, and the colors are retro-lovely. 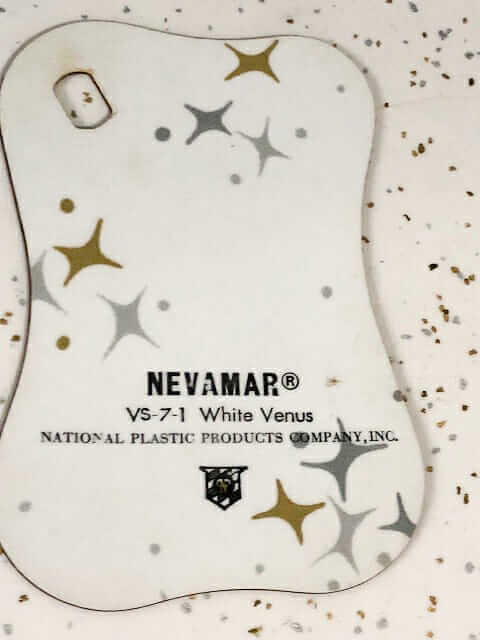 Thanks to Krysten, who found a whole chain of vintage Nevamar at a thrift shop. She’s actually selling the chain to me for the *museum*. Meanwhile, she also sent photos, which I’ll feature bit by bit. 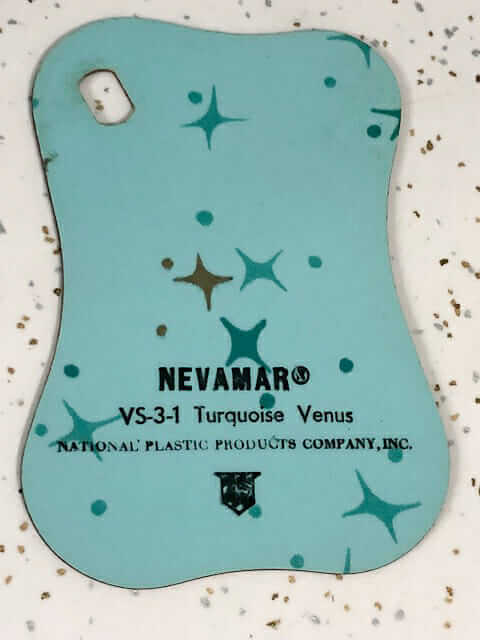 Above: Dreamy Turquoise Venus. 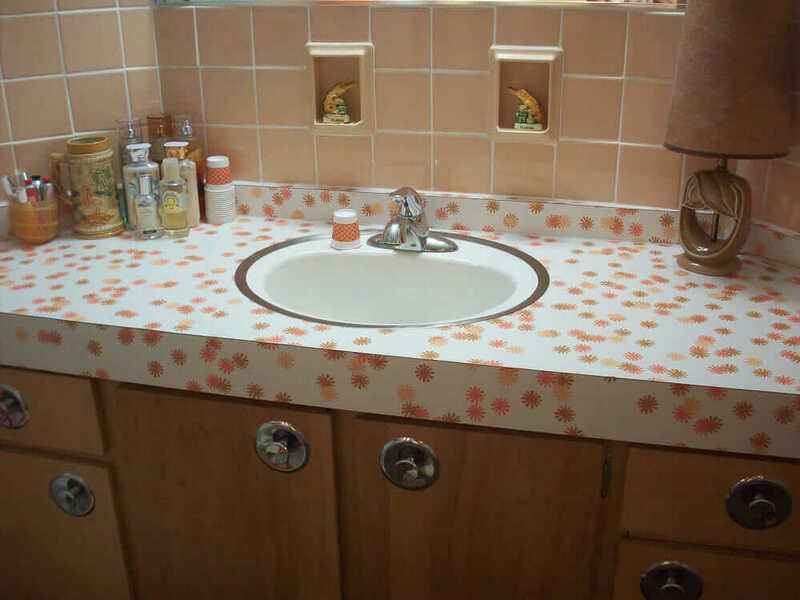 Looks like Krysten has a vintage glitter laminate countertop already, lucky her! White Venus fits right in! 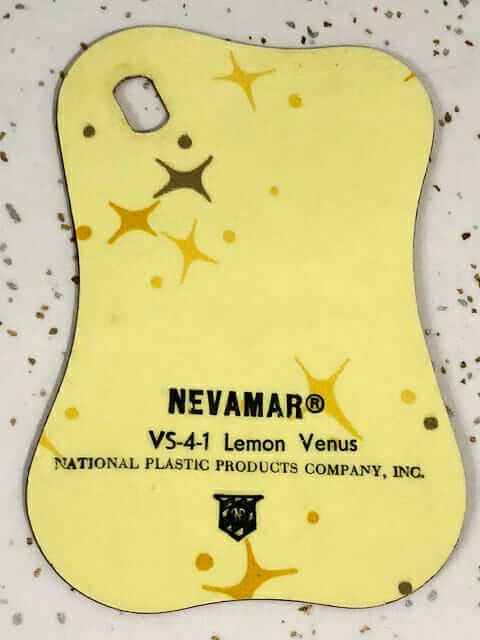 Above: Lemon Venus. Looks like the starbursties are three shades of yellow/gold — nice! 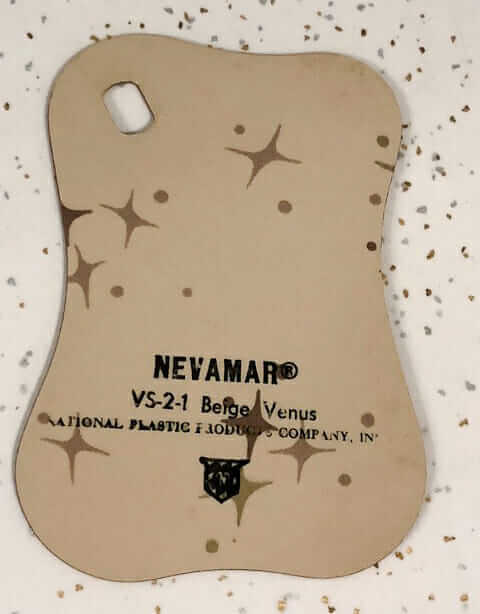 Above: Beige Venus. Very nice. Readers: Alas, you can’t buy this any more. It’s a vintage design no longer made. Personally, I’m anticipating the day Pam opens her “museum” so I can drool over all these wonderful pieces in person! Will there be a gift shop too? The gift shop is just beyond the bar…. We have a similar pattern with a black background on the soffit above our bar. I got really excited for a moment because I thought this was still available! Love how the stars on the laminate are a little blobby. Kinda like hip little sea critters, each relaxed into it’s own mid cent grin. Need a sheet for the bar I am building for a client. Will probably be several more once this one is complete. 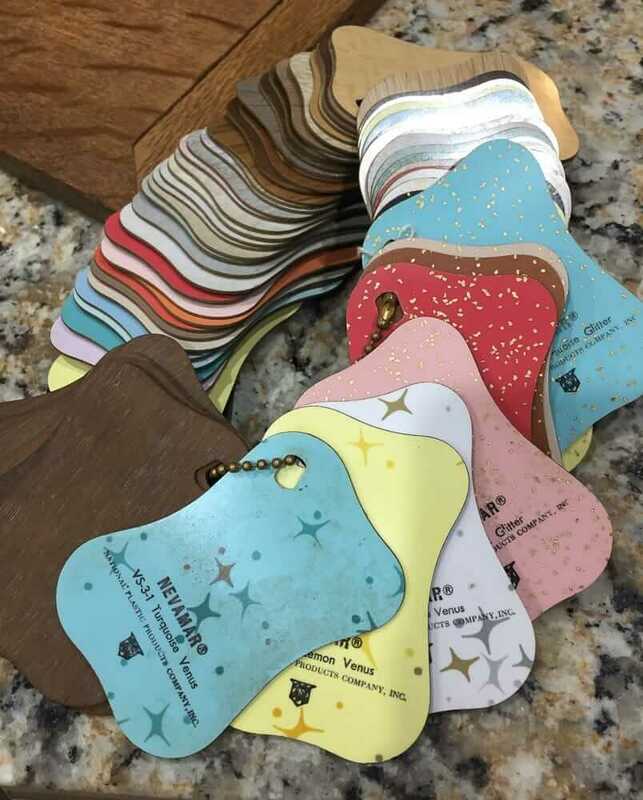 Need a supplier for these products.